The FLIR product in question is a Boson 640, an impressive little camera that records in 640×512 resolution, with a 60 Hz update rate. This one’s got the 95° field of view, giving it a very good specification in a very small footprint. This is a huge improvement over FLIR’s Tau camera, for which [greg] built a breakout board with Ethernet and DDR memory a few years ago. Once he found out about the Boson, he figured a backpack PCB for this camera would be possible and a great excuse to teach himself FPGAs with a hands-on project. With an impressive ability to find the perfect part, [greg] sourced a Lattice iCE40 FPGA in an 8×8 mm package along with an 8 Mbit HyperRAM in a 6×8 package. This combination allows for all the chips to fit behind the Boson camera. Add in an microSD card slot and a few connectors and this breakout board is very close to being a commercial product, for whatever forward looking infrared needs you might have. Here’s a challenge for all you hardware hackers out there. Peter Jansen has opened up the Hot Camera Contest on Hackaday.io to use a thermal imaging camera in a battery-powered project. The challenge here is simple. Use a Flir Lepton thermal imaging camera module in a battery-powered configuration. There’s a catch, though: this is a project to use the Lepton in radiometric mode, where the camera spits out an actual temperature value for each pixel. Yes, this is a documented feature in the Flir Lepton module, but so far very few people are using it, and no one has done it with a small, battery-powered device. The rules for this challenge are to use the Flir Lepton 2.5 in radiometric mode using either the Raspberry Pi Zero W or ESP32. Any software in this challenge must spit out absolute temperature values in a text format, and there must be a demonstration of putting the Flir Lepton into low-power mode. There are two challenges here, one for the Raspi and one for the ESP32; and winner will be named for each. The Flir Lepton is a tiny little thermal camera that’s been available to the Maker community for some time now, first through GroupGets and now through Sparkfun. For a pair of Benjamins, the specs are very impressive: the Lepton has a resolution of 60×80 pixels and everything is can be read over an SPI port. The Lepton gives any project thermal imaging, and the PureThermal board turns the Lepton into a USB device. Peter Jansen is the creator of the Open Source Science Tricorder (yes, it’s a tricorder) which took Fourth Prize in the 2014 Hackaday Prize. You can understand how he became interested in portable, and we’re sure whatever project he has in mind for this battery-powered Flir will be awesome. This really is a great example of what the Hackaday.io community is capable of. The goal here is to create useful Open Source drivers for some very interesting hardware, and there’s some prizes to sweeten the pot. Peter has a $125 Sparkfun gift card on offer for each of the two winners. And the challenge of solving a tricky problem and making designs easier for others is a powerful motivator. Who doesn’t like a challenge? Once it arrived, he pulled the pricey module, connected it to a breakout board and a Raspberry Pi. His gamble paid off; it worked fine. That wasn’t the end of the project, though. He went on to make a portable, self-contained camera with a rechargeable battery and an LCD screen. 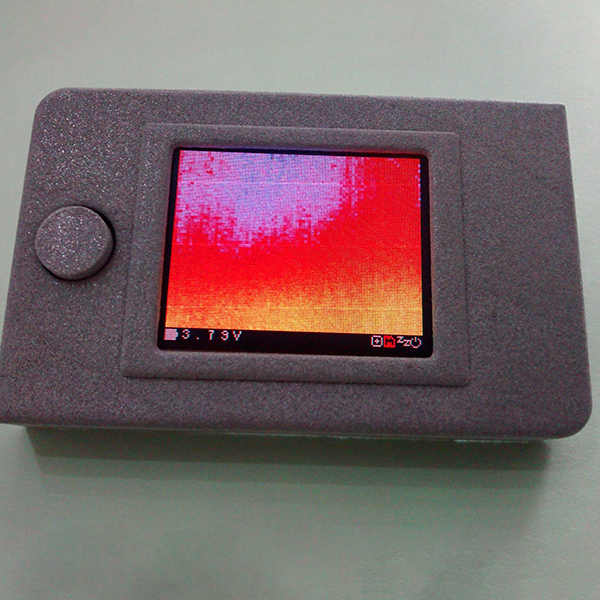 One of the entries in the Hackaday Prize Best Product competition is [x-labz]’s pocket thermal imager. It’s more than a prototype, it’s a design conceived to get out into the world and be used by many. Best Product entries are open until July 24th, and with a $30,000 cash prize on the line let’s take a look at some of the things that elevate a project to product status. Thanks to recent advances in the state of thermal image sensors, a tool that gives you Predator vision is almost a necessity on the modern workbench. The pocket thermal imager will find drafts in your house during winter, will tell you how to cook a steak, figure out what part is shorting out in your latest electronics project, and will tell you how terrible the heated bed is on your 3D printer. [x-labz]’s thermal camera is based around the FLIR Lepton image sensor, an 80×60 pixel thermal imaging sensor that’s good enough for most uses. This camera is soldered onto a PCB sandwich containing an Atmel SAMD21 microcontroller, full-color OLED display, SD card, and a battery management system. What we’ve mentioned so far isn’t out of the ordinary for any other entry in the Hackaday Prize. Building something for the Best Product competition is different, though: a lot of thought has to go into the manufacturability and the fit and finish of this device. So far, everything’s looking great for [x-labz]’s camera. There’s a 3D printed case that looks like it could be easily translated into an injection-moldable shell and at least some of the parts of the user interface are unbelievably satisfying. We’re looking forward to seeing the full Bill of Materials and a business plan (a new requirement this year). That’s an area where many hardware designers lack experience; being able to study the examples from Best Product entries will be a welcomed resource. There’s a world of difference between building a project and building a product, and the entire goal of the Best Product portion of the Hackaday Prize is to reward those people who go the extra mile as aspiring entrepreneurs and show us how that’s done. $50k in cash prizes are set aside for Best Product; $30,000 for the winner as we mentioned before, but there is also $1000 for each of the twenty entries that make it to the finals in this category in addition to some much deserved notoriety from Hackaday’s community of hardware aficionados and early adopters. A few years ago, FLIR unleashed a new line of handheld thermal imagers upon the world. In a manufacturing triumph, the cheapest of these thermal imaging cameras contained the same circuitry as the one that cost six times as much. Much hacking ensued. Once FLIR figured out the people who would be most likely to own a thermal imaging camera can figure out how to upload firmware, the party was over. That doesn’t mean we’re stuck with crippled thermal imaging cameras, though: we can build our own, with better specs than what the big boys are selling. [Max] has been working on his DIY thermal imager for a while now. We first saw it about a year ago, and the results were impressive. This thermal camera is built around the FLIR Lepton sensor, providing thermal images with a resolution of 60 by 80 pixels. These thermal images were combined with a VGA resolution camera to produce the very cool enhanced imagery the commercial unit will get you. There’s also a 1/4-20 threaded insert on the bottom of [Max]’s version, making it far more useful in any experimental setup. Now [Max] has unleashed his DIY Thermocam on the world of Open Hardware, and anyone can build their own for about €400 (about $425). The components required for this build include a FLIR Lepton sensor easily sourced from the Digikey or GroupGets, an Arducam Mini, a Teensy 3.6, and a mishmash of components that are probably kicking around your parts drawers. If you want an overview of this project before digging in, [Max] has a project overview (PDF warning) going over the build. This is one of the better DIY projects we’ve seen recently, and the documentation is fantastic. If you’re thinking about buying one of those fancy thermal imaging cameras, here you go — this one is just as good and half off. When we wrote about [Dan Beaven]’s resin printer a while back he enthusiastically ensured us that, thanks to the recent wave of attention, he would finally finish the project. That’s why today we are covering his entirely unrelated 2 cubic foot print volume FDM printer. As we mentioned, [Dan] is no stranger to 3D printers. His addiction has progressed so far that he needs bigger and bigger parts, but when he looked at the price of printers that could sate his thirst… it wasn’t good. We assume this is the time he decided to leverage his resin printer procrastination to build a massive printer for himself. The frame is aluminum extrusion. The bed is an 1/4″ thick aluminum plate supported just a little bit in from each corner. He can use the 4 motors to level the platform, which is a killer feature on a machine this big. More or less it’s fairly standard mechanically. We are interested in his interesting addition of a FLIR thermal sensor to see live heat distribution. We also applaud him on his redundant safety systems (such as a smoke sensor that’s separately powered from the machine). All the files are available on his site if you’re procrastinating on something and would like one for yourself.